Saudi Foreign Minister Adel al-Jubeir, left, arrives at the White House in Washington for a meeting with President Barack Obama about the Iran nuclear deal, July 17, 2015. . Uneasy about the Iran nuclear deal, Saudi Arabia on Friday sent its foreign minister, Adel al-Jubeir, to the White House, where he received reassurances from President Barack Obama. At a regular briefing after the private meeting, White House spokesman Josh Earnest told reporters that Obama and al-Jubeir talked about the Iranian nuclear agreement announced this week and how to boost security cooperation. “There was a discussion about how to further enhance that close and long-standing partnership,” Earnest said. Secretary of State John Kerry speaks to the media after meeting with Saudi Arabia Foreign Minister Adel bin Ahmed Al-Jubeir at the State Department in Washington, July 16, 2015. The spokesman did not give details of how the U.S. would boost military assistance, but said the discussions built on talks Obama held with senior officials from Saudi Arabia and other Gulf Cooperation Council nations at Camp David in May. At those talks, Obama said the United States was prepared to work jointly with GCC states to deter and confront an external threat to any member's territorial integrity. Saudi leaders have criticized U.S. overtures to Iran, reflecting their concern that easing sanctions will enable Tehran to boost its financing of efforts to destabilize the region, including Yemen. The Saudis also have expressed doubts that a deal will stop Iran from developing a nuclear bomb. Despite this, Saudi officials have neither publicly condemned nor endorsed the Iran nuclear agreement announced Tuesday. The nuclear deal, reached between Iran and six world powers, is expected to be endorsed early Monday by the U.N. Security Council in Vienna, according to diplomats. The resolution will begin the process of lifting international sanctions imposed on Iran, with Tehran giving up its nuclear program in exchange. Visiting British Foreign Secretary Philip Hammond, left, and Israeli Prime Minister Benjamin Netanyahu hold a joint press conference in the prime minister's office in Jerusalem, July 16, 2015. 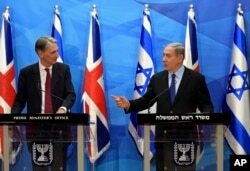 In Jerusalem, British Foreign Secretary Philip Hammond sparred publicly Thursday with Prime Minister Benjamin Netanyahu about the deal before heading into private talks. Netanyahu said the Jewish state would have preferred that Tehran change its behavior first before economic sanctions levied against it by the United Nations and the West were eased. 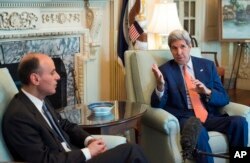 He called it "perplexing" that the pact does not address Tehran's call to annihilate Israel. Hammond said he understood Netanyahu's concerns about the deal, acknowledging that Iran's "regional conduct" would "have to be dealt with in the months and years to come" and that the West was "not naive about this." 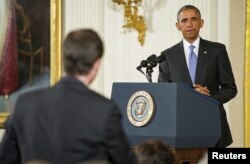 U.S. President Barack Obama takes a question during a news conference about the recent nuclear deal reached with Iran, in the East Room of the White House in Washington, July 15, 2015. Obama vigorously defended the deal Wednesday at a White House news conference that was carried on live television throughout much of the world, although not in Iran. He contended that the deal was the best way to keep Iran from having a nuclear weapon, rejecting attacks on it from Republican opponents in Congress and Republican presidential candidates seeking to succeed him when his White House tenure ends in early 2017. "If 99 percent of the world community and the majority of nuclear experts look at this thing and they say this will prevent Iran from getting a nuclear bomb, and you are arguing either that it does not or that even if it does, it's temporary ... then you should have some alternative," the president said. Obama has said he will veto any congressional rejection of the plan during the 60-day review period that lawmakers have. Congress could override the veto, but that would require a two-thirds majority vote in each chamber.